The Duramax StoreAll lives up to its name and features a 8′ wide format that is a perfect size for most backyard or patios as an extra storage space. 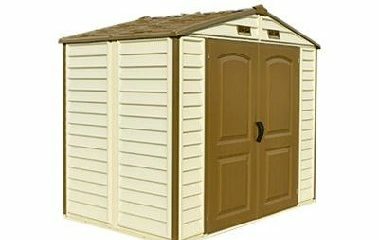 Durability comes with aesthetics as the roof, door and trim have a brown accent that will compliment any landscape. The wall columns are reinforced with solid metal allowing you to easily mount the shelves or tools holder.The Storeall Shed assembly is quick and simple.